Over the summer of 1976, 36 bombs detonate in the heart of Cleveland while a turf war raged between Irish mobster Danny Greene (Ray Stevenson) and the Italian mafia. Based on a true story, Kill the Irishman chronicles Greene’s heroic rise from a tough Cleveland neighborhood to become an enforcer in the local mob. Turning the tables on loan shark Shondor Birns (Christopher Walken) and allying himself with gangster John Nardi (Vincent D’Onofrio), Greene stops taking orders from the mafia and pursues his own power. Surviving countless assassination attempts from the mob and killing off anyone who went after him in retaliation, Danny Greene’s infamous invincibility and notorious fearlessness eventually led to the collapse of mafia syndicates across the U.S. and also earned him the status of the man the mob couldn’t kill. 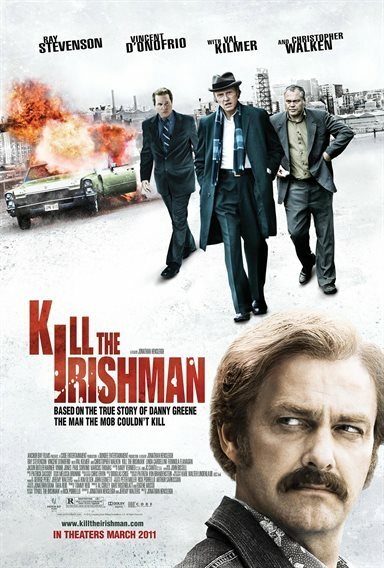 Download Kill the Irishman in Digital HD from the iTunes store. 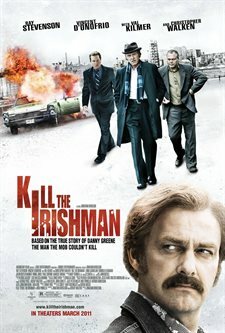 Kill the Irishman images are © Anchor Bay. All Rights Reserved. Kill the Irishman is a who's who of character actors. It features such names as Christopher Walken, Vincent D'Onofrio, Vinne Jones, Val Kilmer, Paul Sorvino and stars Ray Steveson. That's not to say that this makes the movie unwatchable, quite the opposite. Having all these well-known actors is what helps the movie achieve what it might not have had it gone with a bunch of unknowns. The film tells the story of Danny Greene, a local man of Irish descent who grew up in Cleveland during the 1970's. What set Danny apart from other kids were a few things. First Danny was an exceptional sports player gaining some local fame during his high school years. Second, while he was picked on a lot by neighborhood street gangs as a boy, he was never truly afraid; when backed into a corner, instead of cowering in fear, Danny would lash out with all his might. Lastly, he was extremely well read for someone with his background. He didn't just read the newspaper; he read books on a wide variety of subjects. All this helped Danny become the man he was during the 1970's. We get our first real glimpse of Danny when he was working at the ship yards for the unions, unloading containers in 110 degree heat. Everyone around the neighborhood knew Danny and liked him, so it only made sense that people wanted him to run against the head of the unions, Jerry Merke, played by Bob Gunton. When Jerry pulls Danny into his office to discuss the reality of running against him, Jerry explains that he would go to any length dirty under handed length to keep Danny out of office. Danny responds in kind by literally muscling his way into office. It's better if you see the film to enjoy how exactly he does it. Once in office Greene quickly teams with the head of the mob, John Nardi, played by Vincent D'Onofrio, and together they start hauling in tons of merchandise from the containers at the shipyards. This being Danny's first real attempt at organized crime he isn't as mindful as he should be. A reporter for a local paper has been keeping tabs on all the goings-on of Greene and his Italian buddies. When the story finally breaks of Greene's corruption, he is hauled off to jail. His wife, played by Linda Cardellini, is shocked to find out what Danny has been up to. Though to be honest, it seems a little naïve of her to think all their success was simply from Greene running the shipyards. Greene is able to avoid jail time by making a deal with the Feds which he totally ignores and upon his release, returns to his friend Nardi to make ends meet. Nardi introduces Greene to Shondor Birns, played by the always fun to watch Christopher Walken, who is a successful restaurant owner with a loan sharking business on the side. Greene is hired on as muscle to collect on unpaid debts. Along the way he makes friends with the owner of a sanitation company by the name of Mike Frato, played by Steve Shirripa, who you will recognize from The Sopranos. Greene comes up with the idea to organize the sanitation unions and so he enlists the help of an Irish immigrant named Keith Ritson, played by Vinnie Jones, together they muscle their way into the sanitation unions and it is only a matter of time before Greene squares off with Mike. When Mike refuses Greene uses a friend of his to send a message to Mike. In response Mike comes after Danny and in the ensuing fire, Danny kills Mike. He is able to avoid jail time again with the help of his mob buddies insisting it was self-defense, which in a round-a-bout way it was. As time passes and Greene becomes more successful he decides to go into business for himself by opening his own restaurant. He borrows money from big mafia guys in New York and when the courier steals the money Greene is expected to pay it back even though he never actually received it. Greene, being very proud, refuses to pay it back and so they take a hit out on him. After many unsuccessful attempts to try and kill Greene, the mob hires a hit man from California named Ray Ferritto, played by Robert Davi. It's at this point that Danny realizes he may not be as untouchable as he imagines. Considering the films lack of any one big star and its minimal budget, it does a good job of telling the story of one man's attempt at making a good life for himself through illegal means. Stevenson's performance as Greene is done well enough, certainly there won't be an Oscar with his name on it but you never get the feeling that he is "phoning it in". It helps that he is surrounded by some exceptional talent, which boosts the tone of the film. Perhaps the two best parts that stand out in the film are Christopher Walken as Shondor Birns and Paul Sorvino who plays New York mob boss Tony Salerno. The film, while never reaching truly Oscar worthy status, does the job it set out to do, which is to tell the story of a man who made a living through the only means he ever really understood given where he grew up and what was available to him. Given the nature of many of today's films and how underwhelming many of them turn out to be; the fact that this movie can deliver with such simple means goes to show that when you do the job right, it gets done well.